Victor Sandberg scored more than 100 million points in a three-day Missile Command marathon. Back in March, Victor Sandberg did what many had deemed to be impossible: he beat Victor Ali's 1982 world record for Missile Command. Over the course of 56 hours, Sandberg scored a whopping 81,796,035 points, handily surpassing Ali's 80.3 million point record. That being the case, Sandberg recently set to out take the reins of another record by playing his beloved Missile Command for 100 hours straight on a single credit. Sadly, Sandberg's attempt fell short of the mark. While he was able to play the game for a whopping 71 hours and 41 minutes he eventually faltered, failing both to reach his 100 hour goal and to beat the current arcade endurance record held by George Leutz who kept a game of Q*Bert going for 84 hours and 50 minutes. 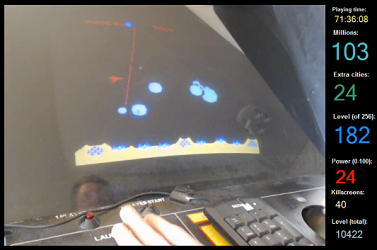 Despite his ultimate failure, Sandberg did at least manage to stomp on his own Missile Command points record, setting a new high mark of 103,809,990 points. We're going to go out on a limb and say that no one's going to be touching that for awhile. Likewise, while he didn't make it to 100 hours, we doubt that anyone's going to criticizing his Missile Command skills any time soon. The man is so danged good at the game that he was able to accumulate enough extra cities to leave the game running and take power naps while it continued bombarding him. The sheer thought that someone could keep playing any game that long at such a high level of skill is, on its own, incredible. To watch the final day of his attempt, you can visit Sandberg's Twitch.tv channel.